An Honest Look at 10Bet - Is 10Bet a Reliable Sportsbook in 2019? When you have established yourself as an online gambling platform back in 2003, and you’re still in existence today, there’s a strong chance that there’s a lot to enjoy on your site. 10Bet has such statistics, first opening its online doors about 15 years ago. The site brings forth an online sportsbook, but also incorporates both a standard casino and a live casino alongside. Therefore, players of this platform are able to enjoy a number of different betting options. Live betting is also on hand, ensuring that you can place wagers in the moment. 10Bet is operated by a company known as Ocean Star Limited, which is based and registered in the country of Malta. This means that it also holds a gambling license from the Malta Gaming Authority. Therefore, all of your gaming activities at this platform will take place in a secure and fair environment. If you want to find out more about this gambling license, there’s a bit of information on display across the bottom of the 10Bet website relating to such. While it does hold a license in Malta, making everything legal, this also means that it doesn’t allow certain countries to sign up and place bets there. Some of the world’s largest gambling markets are restricted from the 10Bet site, including the United States, the United Kingdom, Denmark, France, China, Australia, Mexico, and South Africa. This is a bit of a downfall for the platform, although for those residents of countries that can sign up, 10Bet is sure to provide a treat. The 10Bet platform is also accessible via a mobile device. This means that you have the chance to take the sports betting and casino game options on the move with you. All you need to do in order to access the mobile version of 10Bet is enter its website address into your smartphone or tablet’s browser. This will then provide you with the optimized version of the site, giving you the best view of it on your device’s screen. Overall, the site and everything it provides is altogether inviting and appealing. 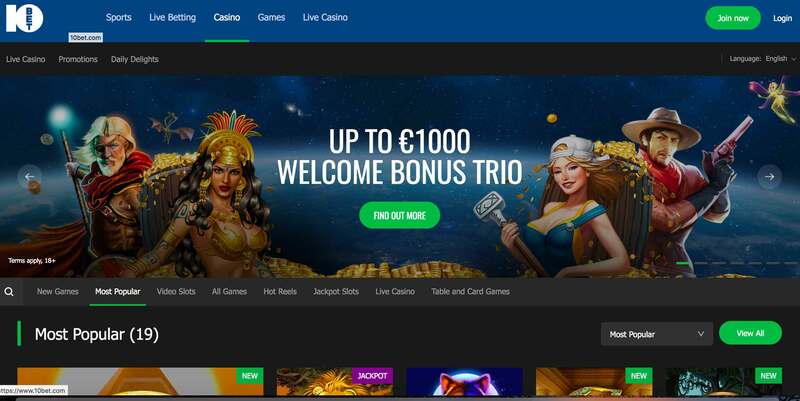 Being a platform that provides both sportsbook and casino options, the 10Bet site enables its players to claim various offers, depending upon what section they decide to gamble in. If you’re more of a sports bettor, then there is a welcome bonus for you as a newcomer. This is able to provide you with up to €100. Simply complete your registration and then transfer your first deposit into your account, using the code FD10BET at the same time. You’ll then receive a 50% bonus on top of this deposit. With this, you’re able to truly enhance your first days as a bettor at 10Bet, but be aware that deposits via Skrill or Neteller do not qualify for it. Alternatively, if you have more of a preference for playing casino games, you can claim the welcome offer for casino gamers. This provides you with a trio of bonuses across your first three deposits there. The first of these is able to offer up a 100% bonus, which comes with a maximum value to it of €200. Make sure that you utilize the promotional code of 200FIRST when you make your initial deposit. On your second casino deposit, you need to use the bonus code of 300SECOND to get 50% up to €300. And finally, with the bonus code of 500THIRD on your third deposit, you’ll receive a 25% bonus up to €500. This means that you have a total of €1,000 to claim as a casino newbie! Finally, there’s a special offer that is available to newcomers who decide to play in the site’s live casino section. This provides you with the chance to enjoy some of the classic live games, including baccarat and roulette, with a special bonus of €100. So, log into your account and make a deposit of €20 or more, utilizing the code of 100GOLIVE at the same time. 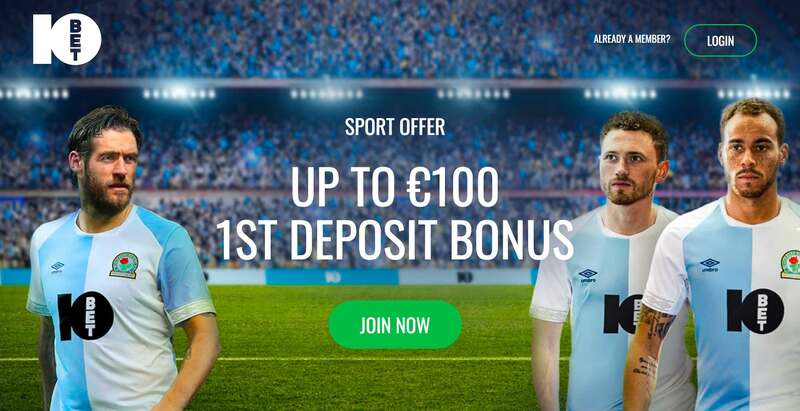 This then adds a 100% bonus up to €100 on top of your deposit. Plus, some of the live dealer games, such as Live Roulette and Live Wheel, will contribute 100% of your bet towards the completion of wagering requirements with this one! Adding funds to your 10Bet account is something that you can do in a number of different ways, as the site accepts a few alternative payment methods. First of all, you can utilize one of several different credit or debit cards, including Visa, Maestro, and Mastercard. You can also make use of an e-wallet, with ecoPayz, Skrill, and Neteller deposits being accepted at 10Bet. If you prefer using prepaid cards, then the Paysafecard option is available to you to make use of, while various fast bank transfer possibilities are also available. Lastly, if you can’t utilize any of those options, then you also have the option to add funds to your 10Bet account via a bank wire transfer. You’ll also be able to withdraw money from your account by using many of the same payment methods. The minimum withdrawal amount and the time that it will take to complete depends entirely on the payment method that is being used. For withdrawing from your casino cash account, you need to first transfer this to your sports cash account. This is due to the fact that you’re only able to make withdrawals from your 10Bet sports cash account. As is standard, though, all withdrawals will be processed back to the same payment method that was used to make your deposit. In the event that this is not possible, a bank wire transfer will be used instead. The maximum total withdrawal on the whole that this platform allows stands at €50,000 within a 30-day period for the sportsbook. As far as the casino goes, the maximum withdrawal there is limited to €2,000 per seven days. Should You Play at 10Bet? It’s easy to see why the 10Bet platform is so popular. There are many intriguing sportsbook options that are available to you to bet on, while the casino also gives you multiple titles to access and enjoy. Additionally, the fact that there are several different payment methods for you to use when it comes to depositing and withdrawing makes this platform even more appealing. You’ll also find that everything is very well-designed at 10Bet, giving you easy access to everything that you would like to wager on. With this being the case, it’s quite a let-down to learn that several big gambling markets aren’t able to sign up and experience what the 10Bet site has to offer. This is perhaps the platform’s biggest downfall. But for players from those countries that are accepted at the site, there’s plenty to look forward to there. This also includes the ability to play the games and place sports bets from your mobile device. Therefore, as an owner of a smartphone or a tablet, you’ll easily be able to log into the site and utilize your deposited funds as you like from any location!